Michael Adu-Carol is multi-skilled specializing mainly in ministry and Christian leadership. He has a certificate in Leadership and Entrepreneurship; he also has a certificate in Christian leadership called “Pastors mentoring Pastors.” He was awarded a certificate in Transformational Urban Leadership (CTUL) which was organized by the Trinity Theological Seminary in Ghana. In 2012, he earned a certificate in Ministry from the Richard Roberts of Ministry-Tulsa, Oklahoma as well as a certificate in Church Missions Leadership. He obtained a Diploma in Theology with Management from the Christian Leadership College, Accra. In June 2009, he obtained an intermediate in Electrical Installation (City & Guilds) from the Accra Technical Training Centre. 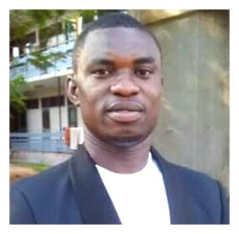 Michael served as a schools coordinator at the Scripture Union Ghana in Accra and also as Bible Ministries project officer for Scripture Union Ghana. Until he joined Edify, Michael served as Business Development and Church Relations Officer at the Scripture Union Ghana office in Accra. He has an amazing career as volunteer for several Christian organizations including the following: Bible Society of Ghana, Torchbearers Mission Incorporated, Scripture Union Ghana Camps Ministry and a Youth Mobilization of the Ghana Greater Peace Crusade. As Assistant Christian Transformation and Training Officer, Michael will add his experience mobilizing youth and use his talents to expand the Kingdom.